Is Google Fiber on the horizon for Jacksonville? Jacksonville, FL – Google announced Wednesday that it’s working with city officials to bring Google Fiber to Jacksonville. This will be the starting phase to a large project that hopes to bring internet speeds in the city to a lightning-quick one gigabyte per second, which equals to 1,000 megabytes per second. Standard internet service provider’s speeds average at about 12 megabytes per second. Google Fiber is currently available to subscribers in Kansas City, Mo., Provo, Utah, and Austin, Texas. In addition to Jacksonville, Tampa, Fl. and Oklahoma City, Ok. were also announced as potential fiber cities today. But don’t get too excited just yet, city officials and Google still have lots of work to do before the service is available for use and could take up to a year and a half before people can start subscribing. 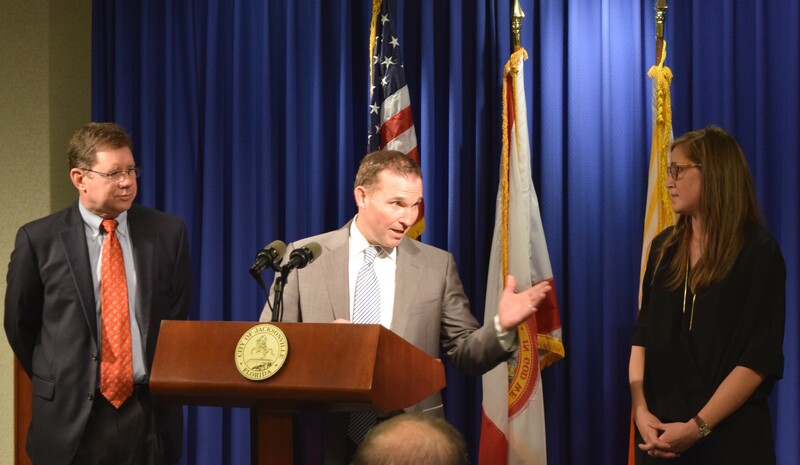 Google will work closely with Jacksonville officials to obtain permitting, learn infrastructure requirements, and infrastructure placement. The next few months will rely on information gathering to determine whether building this fiber-optic network in Jacksonville will be disruptive to the community. There is currently no concrete timetable as to when Google Fiber will be up and running but the city is certainly performing its due diligence beforehand. “Jacksonville applied when we first started this project five years ago,” said Ashley Kroh, director of expansion of Google Fiber, “We got around 1,100 applicants and Jacksonville was certainly a selection by us,” when asked if Jacksonville initiated contact to be selected. Kroh also stated that Google will not seek any incentives, public funds, or tax breaks if the fiber-optic network is allowed by the city. This could mean big things for Florida State College at Jacksonville. Having a reliable, cheaper, and above all faster network could mean better online implementation for blackboard or Deerwood’s Open Campus curriculum. The new infrastructure, in theory, could allow every student on campus to connect to the network with their smartphone, laptop, and tablet, at the same time.